Basking in Mont Blanc-ness atop Brevent one week before CCC. Ten thirty-five to forty-eight ten: the range of my emotions, in vertical metres that is. I’ve long postponed my CCC race report, admittedly overwhelmed with the idea of trying to cram everything I saw and did into one blog post. 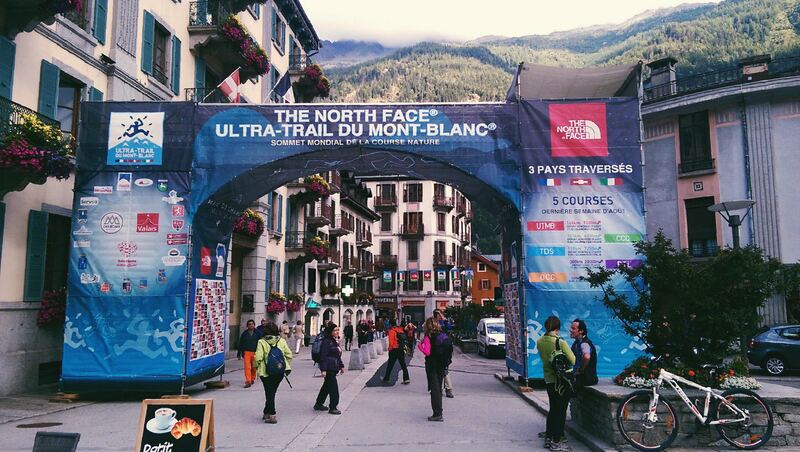 My week in Chamonix, then taking part in one of the races of the North Face Ultra Trail du Mont-Blanc was a sensorial whirlwind, a rich, multifaceted experience which leaves me disoriented and not knowing where to begin… At the beginning, I suppose. In this post I’ll briefly detail my adventures leading up to CCC 2014 and leave the “race report” (and all the pics from the race) for the next post. My preparations to run CCC — once the “little sister of the UTMB” and now one of the most prestigious 100km races in the world — began two years ago. I don’t know why I thought running this race would be a good idea, but expected it to be epic, scenic and cater to my particular strengths (i.e. slogging up mountains, then running down them). I raced around on fifty miles of ski runs and mountain bike trails at Meet Your Maker in Whistler, BC last summer to garner two qualifying points needed to register. Fast forward six months and by some grace of God I won the lottery and became one of a few Canadians among 1500 others toeing the line in Courmayeur on August 29th. First day in Cham… the stokage runs high. Aiguille Verte (4122m) and the Drus, seen from near L’Index on Brevent. Descending from Le Brévent on right, back down toward Planpraz gondi station as the first stretch of my run. Mont Blanc, looking real fine… Summit is snowy high-point on right. Seeing kids in the mountains always makes me a little misty because I’m so passionate about them now and never saw a true mountain until my twenties. Instead I used to love aimlessly scrambling and jumping to and from the boulders in cottage country, an activity which has directly influenced my trail-running now. This dude was doing much the same except the backdrop isn’t Lake Huron, it’s the tallest mountain in western Europe. He wasn’t too concerned with the scenery, however; his animated scrambles kept him busy most of the time at Col Cornu. Some of the awesomer trail running I’ve done. ^The crowd goes wild: start of PTL 2014, downtown Chamonix. Before this trip I neither knew nor cared about PTL but now recognize it as the more-badass, more-underground version of UTMB and has risen to the top of my ultrarunning bucket list. 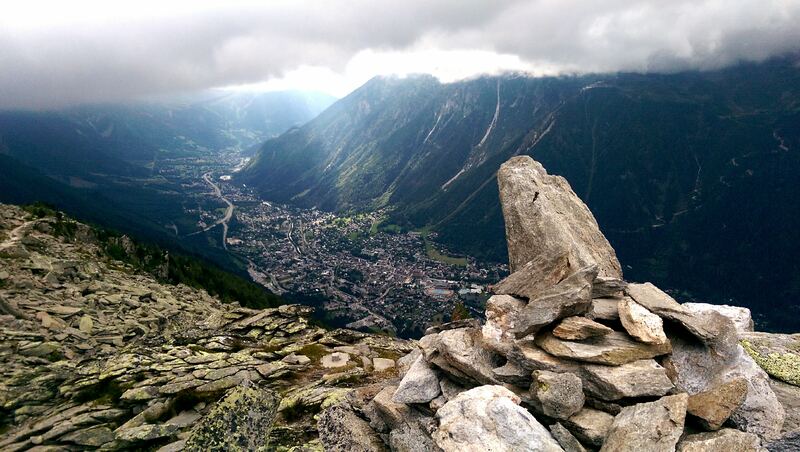 The Promised Land of Chamonix, seen from Signal Forbes on a rainy day. On day three, I threw on my running pack and headed up to Balme for some Swiss pasture style trail-running. No, I didn’t need more cowbell; there was plenty to be had up there booting around on white ribbon singletrack to all the little knolls and viewpoints overlooking Chamonix on one side, Trient on the other. At last, I hit up the Albert 1er hut at the base of the Glacier du Tour as the clouds cleared to reveal the Aiguilles du Tour and Chardonnet. Tres awesome! 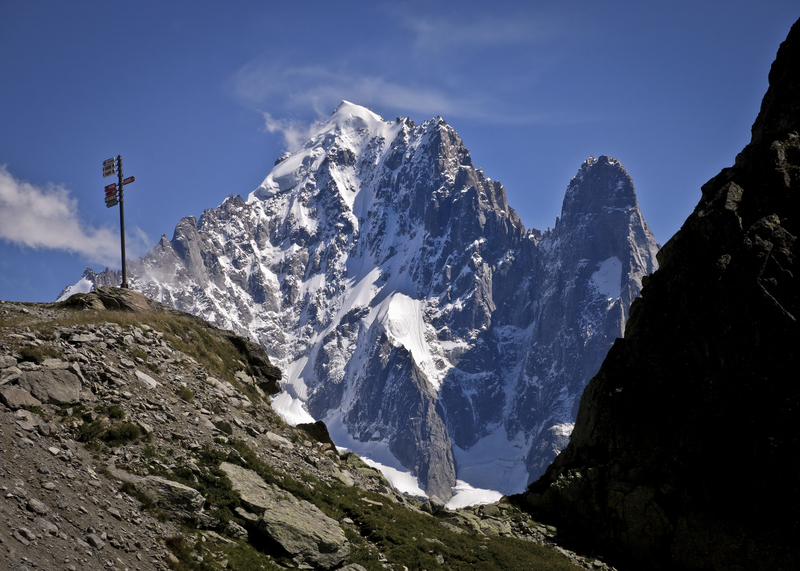 Heading up to peep the Croix Fer (iron cross) in Balme area, Switzerland. 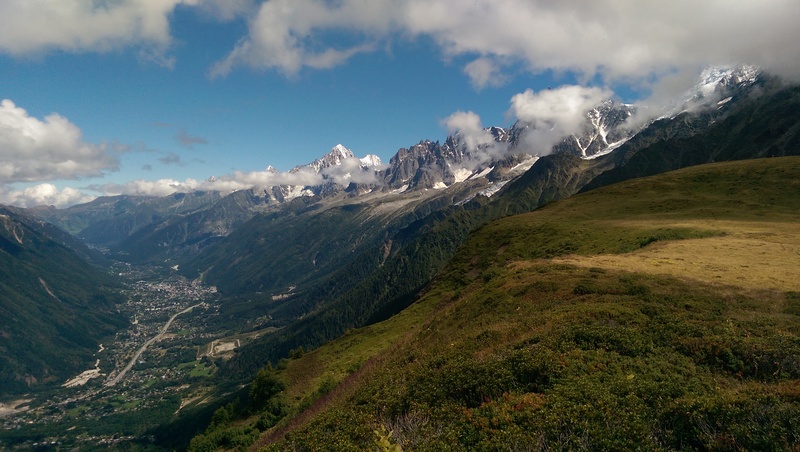 Looks like fun trail-running to me… Mont Blanc on left, Chamonix down below. Peeps chilling at the Croix Fer, amongst the clouds. Looking down to the village of Vallorcine from near the Tête de Balme (2321m). 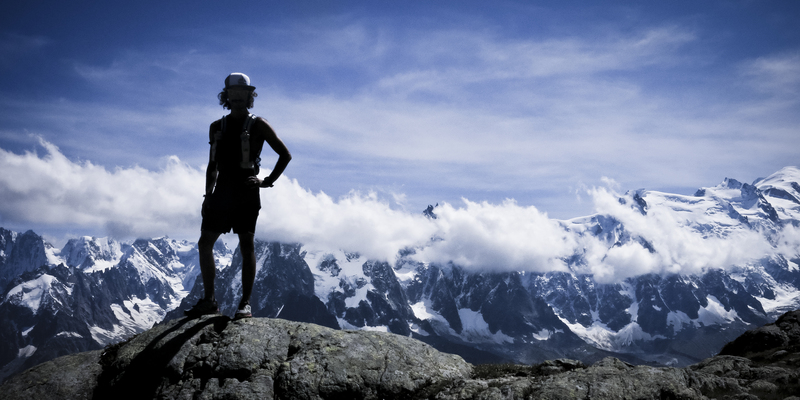 Trail-runner glory shot atop Aiguillette des Posettes (2201m). Mont Blanc and Chamonix in the background. Old man chilling out, overlooking Vallorcine. assumed everyone in Europe was an uber-fit trail-runner; even here I can take the suggested times and cut them in half. Dejeuner at the Col de Balme kitchen… Sure beats energy gels and granola bars. “Let a sleeping dog lie”… THAT’S WHAT I’M FREAKING DOING! Looking across the Glacier de Tour toward Aiguille du Chardonnet, presently hidden in the clouds. Pinnacle-like Aiguille du Tour (3529m). Aiguille du Chardonnet (3824m) reveals itself just as I reached my hypothermia-threshold shirtless beside the Glacier du Tour. Looking across the valley from above the Albert 1er refuge. You know you’re a versatile runner when you can gorge yourself with Indian food, miss the last bus, then run 6km home with a loaded pack (containing all your mandatory equipment), a bag of groceries in one hand and boxed dinner in the other, pausing occasionally to let my meal “express itself”. Casual running at its finest! Getting into rest and recovery mode: overlooking Chamonix from Mont Lachat. One day before my race, I sought out a low-intensity activity to exploit the nice weather and went up the Aiguille du Midi cablecar for sweet views, zero exertion required. After snapping about a million pics of the Mont Blanc massive and surrounding eye-candy, I strolled into a tunnel with my shades on and saw two scrawny alpinists walking towards me. It took a moment for my eyes to adjust and as they passed we gave each other a quizzical stare: it was Kilian Jornet and Emilie Forsberg! I walked past all giddy and awkward, saying nothing, but then thought to myself that I should at least go back and shake their hands, or something. I pulled a U-turn and raced back, searching all the logical places they might be. Nowhere to be found. Puzzled and a little disappointed, I gaze out across the ocean of mountains and what do I see? Kilian and Emilie charging down a steep snow ridge other parties are shuffling along roped together. I was in awe, and felt fortunate that I spotted these ultrarunning idols in action instead of just mulling around town, for example. An auspicious experience which got me super-stoked less than twenty-four hours before my race! Longest unsupported cablecar in the world… I’m not terrified! Hang ten, Mont Blanc. Hang Ten. Cham and the Aguilles Rouges range. Practicing my race-day shudder… I mean stare. Helbronner gondi to the Italian side of Mont Blanc. Kilian Jornet’s idea of “trail running”.